Winning in Las Vegas: Cox Automotive, with Autotrader and Kelley Blue Book brands, to Make Car Buying Faster, More Enjoyable - Cox Automotive Inc. In Las Vegas, car buying is about to change. Las Vegas car shoppers are among the first in the U.S. with access to AccelerateSM, Cox Automotive’s new connected retail platform, now available across Autotrader and Kelley Blue Book’s KBB.com, offering a set of online tools to assist with the buying process. Accelerate helps make car buying faster, easier and more enjoyable, and can save consumers up to an hour at the dealership, thanks to a simple, more efficient and integrated online experience for both consumers and dealers. ATLANTA – March 12, 2018 – In Las Vegas, car buying is about to change. Las Vegas car shoppers are among the first in the U.S. with access to AccelerateSM, Cox Automotive’s new connected retail platform, now available across Autotrader and Kelley Blue Book’s KBB.com, offering a set of online tools to assist with the buying process. Accelerate helps make car buying faster, easier and more enjoyable, and can save consumers up to an hour at the dealership, thanks to a simple, more efficient and integrated online experience for both consumers and dealers. The typical car buyer in the U.S. spends more than three hours in the dealership from start to finish, according to Cox Automotive’s 2018 Car Buyer Journey Study. For 50 percent of new-car buyers in America, that’s entirely too long. The first market-wide launch in Las Vegas includes 24 of the city’s dealerships using Accelerate initially on their Autotrader listings, followed by listings on KBB.com. In all, more than 10,000 vehicles – an estimated 43 percent of the available inventory in the Las Vegas market on Autotrader – will be faster to buy using Accelerate. Further market expansion of Accelerate across the U.S. is scheduled throughout 2018. Accelerate tools also will be made available across many of the dealer websites powered by Dealer.com in 2018. Dealer.com, a Cox Automotive brand, currently supports more than 60 percent of franchised dealership websites across the U.S. – more than 13,000 total. More than 26,000 dealers in the U.S. use Cox Automotive’s Autotrader, KBB.com and Dealer.com to market and sell cars. Cox Automotive’s two car-shopping sites – Autotrader and Kelley Blue Book’s KBB.com – each host nearly 20 million visitors per month. According to the recently released Cox Automotive 2018 Future of Digital Retail Study, Accelerate is designed for the 70 percent of consumers who are more likely to buy from a dealership where they can start the process online. Using Accelerate means once consumers get to the dealership, they can review and sign the deal quickly and confidently. Calculate Real Monthly Payments – Before heading to the dealership, shoppers can start their purchase online by creating customized monthly payments with personalized shopper selections for target price, credit score and financing terms. This also includes conditional programs such as military discounts and loyalty cash, applicable incentives and rebates, trade-in value, F&I products (if available), as well as taxes and fees based on zip code. Receive Trade-in Values – Receiving a trade-in value from Kelley Blue Book, the industry’s most trusted resource, speeds up the deal. When dealers use the same tool consumers use, expectations line up and both sides win. 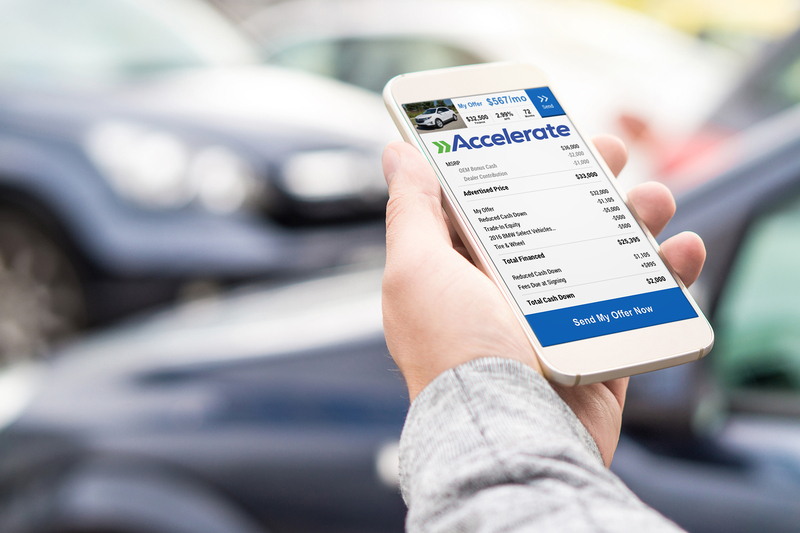 Accelerate is the only digital retailing solution to seamlessly integrate a Kelley Blue Book® Trade-In Value or the Kelley Blue BookSM Instant Cash Offer, providing car owners an actual offer for their vehicle. Secure Online Financing and Approvals – Accelerate integrates real financing programs, going beyond credit pre-qualification and enabling consumers to secure actual financing. This quick, easy and secure way to capture consumer credit information speeds up the financing process and reduces paperwork at the dealership. Showcase F&I Products – With 71 percent of shoppers interested in learning about F&I products at home and before entering the dealership, Accelerate provides consumers with engaging content and videos, dealer-specific retail pricing, and real monthly payments for aftermarket products. Cox Automotive research indicates 63 percent of consumers are more likely to buy F&I products if they shop F&I products online, at their own pace and away from the dealership. Accept Deal Terms and Reserve a Vehicle – Shoppers can customize payments and accept personalized deal terms online, as well as provide a deposit to reserve a vehicle and schedule a test drive. Accelerate exemplifies the power of Cox Automotive’s family of brands, uniting the most complete online car-shopping experience in Autotrader, the most-trusted brand for car pricing, research, and valuations in Kelley Blue Book, and the premier digital marketing solution and partner for dealers in Dealer.com. In addition, Cox Automotive’s unsurpassed consumer reach helps dealers engage with motivated buyers at every stage along their path to the showroom. With its large portfolio of retail solutions, Cox Automotive intends to expand the capabilities of Accelerate to include transaction capabilities with e-signature for car buyers opting for the fully digital experience from start to finish, one that dealers can deliver online, in-store or any combination their customers prefer. Consumer advertising for Accelerate will commence in early March 2018 in Las Vegas, with radio, digital and outdoor executions. The all-new Autotrader experience, which is undergoing dramatic transformation throughout 2018, is the centerpiece of the marketing efforts, with a focus on a quick, more convenient buying experience through Accelerate.